It is my hope and prayer, that after spending some time exploring this website, you will make the decision to visit us in person. You will find a warm and welcoming family of faith that will remind you that when you feel you belong perhaps nowhere else, you belong here at Covenant. Welcome Home. Parking is available behind the church. You can access it from Pecan Street or W Laurel Street. 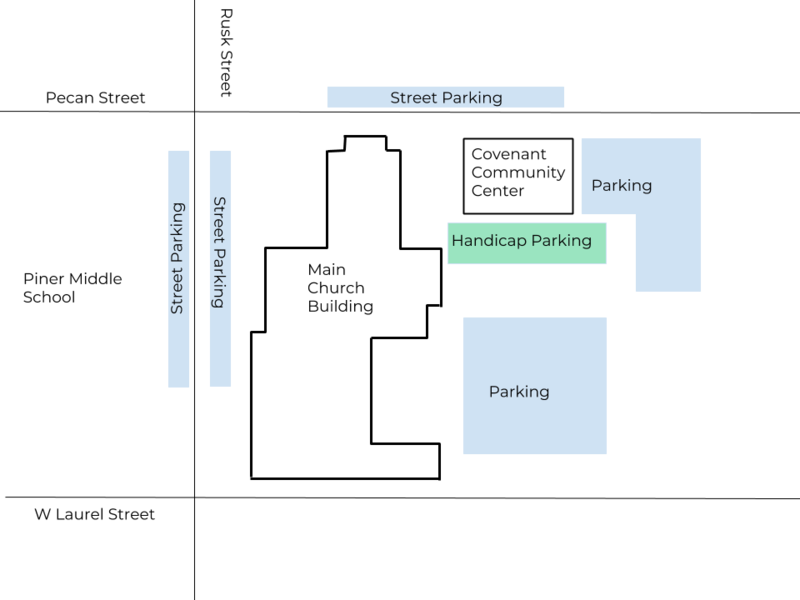 There is also street parking available on Rusk Street on both sides as well as limited street parking on Pecan Street. Parking at Piner Middle School is also available. To access our Handicap parking, come in from Pecan Street. Worship begins every Sunday morning at 10:50 a.m. in our Sanctuary. People start arriving around 10:30 up until the service starts. Our Greeters and Ushers can help answer any questions you might have. They can also direct you to our Welcome Table for you to find out more information about us. 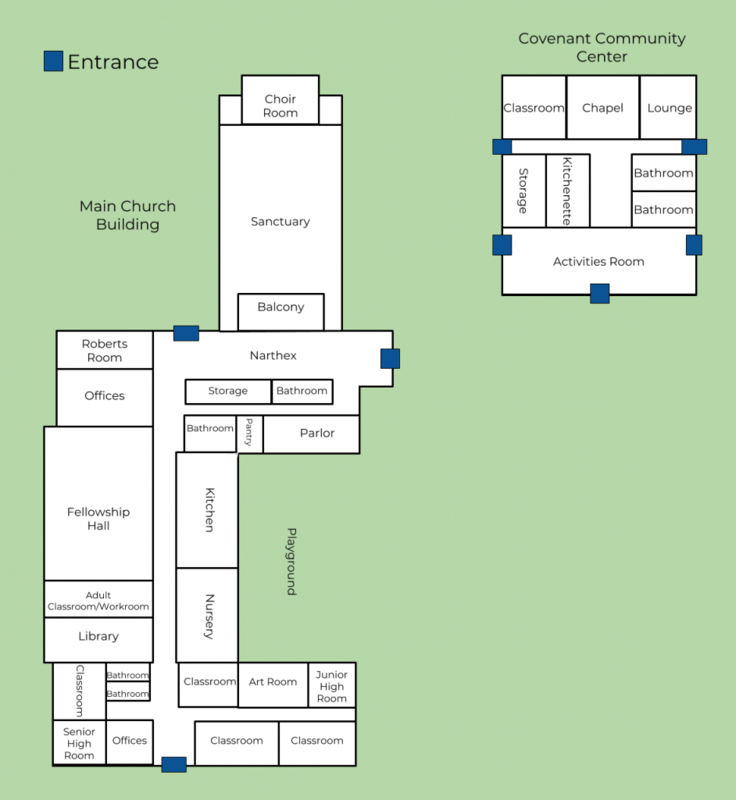 You can sit in our Sanctuary or go up the stairs and sit in the Balcony both of which are accessible in our Narthex. Where ever you feel comfortable, there is a place for you. When you join us for worship on Sundays, you will find people in a suit and tie or dresses, but you will also find people in jeans and shirts. We have a “come as you are” dress policy. From flip flops to button downs, we want you to feel comfortable when you worship with us. Sunday School classes are offered at 9:30 a.m. Sunday mornings for all ages. Covenant Presbyterian Church has one worship service at 10:50 a.m. and it is structured in the traditional Reformed worship style. 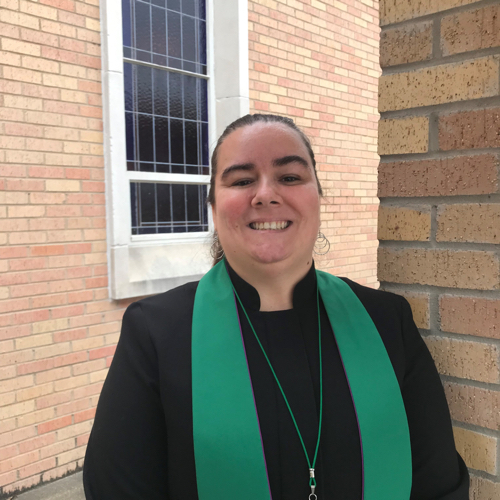 We sing hymns, listen to scripture, recite prayers, and hear a sermon from our Pastor Lisa Perkins. We would love for you to consider becoming a member of our church community. If you would like to join, contact Pastor Lisa Perkins and she will get in touch with you to begin taking steps to become a member. We have a wonderful staff that leads the church and help develops the community we aim to become.